I’m holding on to summer with both hands, and you’d be hard-pressed to find an item that screams summer to me more than popsicles. Genuinely. I can remember how much I looked forward to freezer pops as a kid. The cold, sugar-y sweet treats that always ended in sticky fingers and colored tongues were a childhood favorite for me. And I’ve passed my love of popsicles on to my children. Like most moms these days, though, I do find myself trying to limit the amount of sugar my kids regularly inhale. So, after a long run with a friend where we discussed everything from easy freezer pop recipes to kids sleep remedies, I decided to give DIY freezer pops a try! What’s more, the girls had a great time helping me! They loved tossing all the ingredients into the blender or food processor to make a liquid and then pouring the liquid into freezer pop bags for freezing and storing. Although there are lots of inexpensive freezer pop trays available at stores such as Walmart and Dollar Tree, we decided to use freezer pop bags to make storing and enjoying easier. 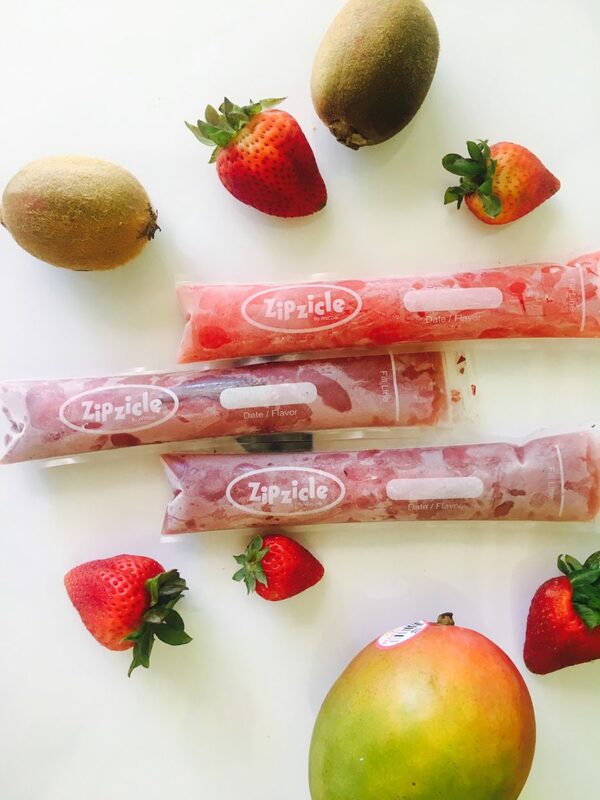 We found some from an awesome brand called Zipzicle on Amazon and have been totally happy with how well they hold up! Some of our most-favorite recipes were just the result of the girls throwing things into the food processor. For example, my middle daughter’s favorite recipe is a Strawberry Lemonade freezer pop. We simply took a lemonade juicebox, a cup of ice and 5-6 strawberries with stems cut off. 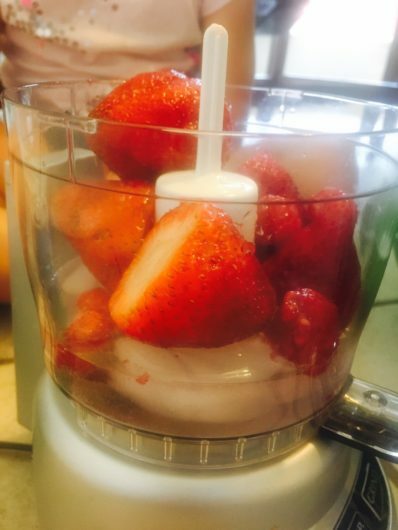 We added all the ingredients to the blender and blended until smooth, poured the smoothie into freezer pop bags and let them freeze for about an hour. She loved it! My favorite part about making my own freezer pops was being able to control the ingredients. We didn’t add any sugar to any of our creations. But we did add lots of superfoods, the way you might add them to a smoothie. We tried kale in a few freezer pops. We also added chia seeds and flax seeds to several recipes. If something wasn’t quite sweet enough we used honey, and low sugar juice boxes when we needed a more substantial base than water. Coconut water also made a great, hydrating ingredient! My oldest daughter, who has learned a lot about healthier eating at school this year, was all about trying healthier options. Her most-favorite recipe incorporates a few superfood items we both swear you can’t taste once everything is blended together. We call hers the apple berry flavor. Her freezer pop uses apple juice as the base. We used one apple juice box plus one cup of ice, then blended it with half a cup each of blueberries, strawberries and raspberries. She then included chia seeds and flax seeds in her recipe to give it a boost. These are literally so yummy I sometimes eat them for breakfast. And they are far healthier than many of the cereals my kids adore so much. We also loved just slicing up whole fruit and popping it directly into the freezer bags. Kiwi, grapes (cut in half or quartered), berries, orange slices (especially Cutie slices, as they were the perfect size! ), mango, pomegranate seeds. These are all fantastic choices! Add them directly to a freezer pop bag, fill the bag to the fill line with coconut water (or a sports drinks for sweetness) and freeze. The electrolytes will help refresh the kiddos (or mommies!) after a long, fun day of playing outside in the summer sunshine! 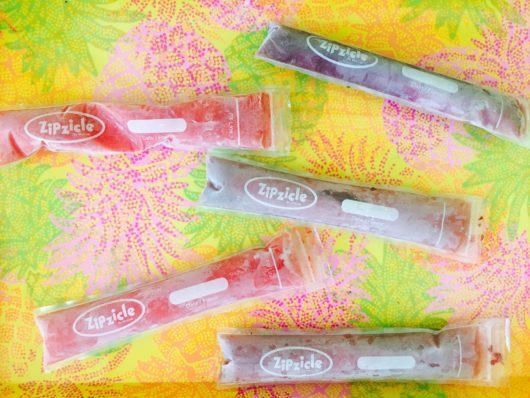 What are your favorite ingredients for DIY freezer pops?